A few "finger-tip facts" about our beautiful country of service--Guatemala, Central America, "The Land of Eternal Springtime. : Location: Guatemala is located just south of Mexico. To the south borders Honduras and El Salvador and Belize is off the N.E. border. Anyone traveling into Central/South America by car must travel through Guatemala to get there. Our ministry is located in Camotan, Chiquimula, between Zacapa and Esquipulas, 4 hours east of Guatemala City...just 1 hours from the border where Guatemala meets Honduras and El Salvador. Population: Just over 13 million people, with 45% being Indians (Mayan) and the other 55% of mixed Spanish/Indian ancestry. Official Language: Spanish (although there are 22 Mayan dialects spoken by the various indigenous families). Often English is spoken (or at least understood) in the "tourist" sections of the country. Chief Products: Agriculture--bananas, beans, beef cattle, cardamom, coffee, corn, cotton, sugar cane. Manufacturing--clothing and textiles, handicrafts, processed foods and beverages. Money: "Quetzales" (named after a nearly extinct bird, native to Guatemala). The denominations are like those in the U.S. -- Q1.00 (green), Q5.00 (purple), Q10.00 (red), Q20.00 (blue), Q50.00 (orange), Q100.00 (light brown)...and coins in 1, 5, 10, 25, & 50 "centavos" denominations. There is also a Q1 "gold" coin. Presently the exchange rate is approximately $1.00 (U.S.) = Q7.50. Taxes: Most goods and services are subject to a 12% tax (IVA). Hotels also add an additional 10% tax on top of that. In restaurants, tipping is at the discretion of the customer, but 10% is usual. Climate: Tropical, where temperatures vary greatly from area to area due to great differences in elevation. There are six months of rain basicallyl from May - October and then six months of dry weather from November - April. 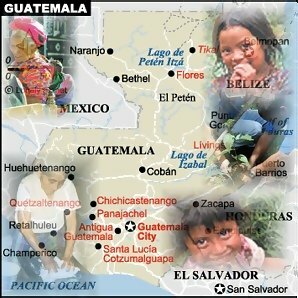 Economy: Guatemala is a developing country and the economy is slow. Government: Guatemala has a demoncratic government with a president and elected representatives. Elections are held every 4 years. Education: Approximately 55% attend primary school; only about 15% go to high school. The overall literacy rate is approximately 46%.